Lawter is pleased to announce that long-time employee Gene Cassidy, Senior Manager-Corporate Accounts, recently received national recognition for his contributions to the printing ink industry. The National Association of Printing Ink Manufacturers (NAPIM), which is the only national trade association for the printing ink industry in the USA, held its annual convention in Sonoma, California last month, where the organization presented Cassidy with the prestigious Pioneer Award. During the convention, NAPIM awards selective participants as Printing Ink Pioneers. 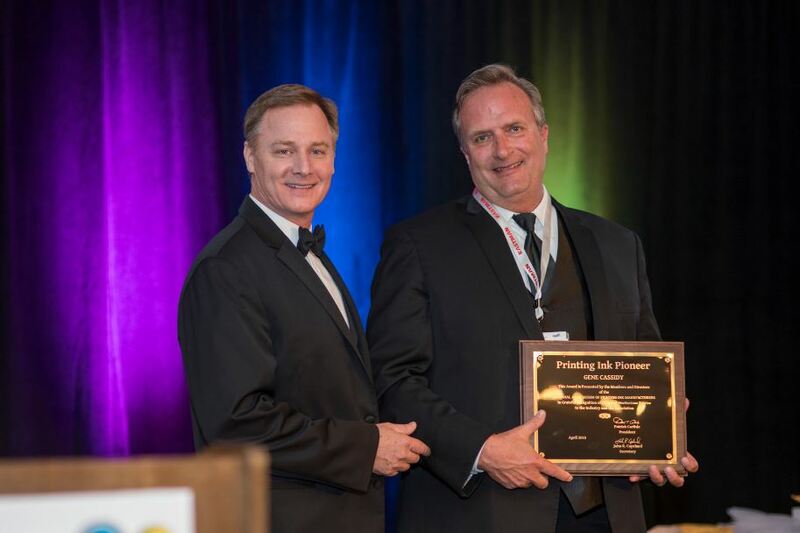 This year, Cassidy received the award for his contribution to the printing ink industry. The annual Pioneer Award winner must have worked in the industry for at least 25 years and have shown substantial service and technical contributions to the industry. Cassidy started his career in the graphic arts in 1976 and joined Lawter in 1978, where he is still employed as senior account manager. “It is an extreme honor to be the recipient of such a prestigious award. During my forty years of employment at Lawter, I have had the pleasure of working with a long list of talented people, that made my job very enjoyable and rewarding,” Cassidy said. Harima Chemicals Group, including LAWTER, will continue contributing to the printing ink industry all over the world by supplying quality raw materials and developing innovative products. “I would like to thank Gene for being a great representative of Lawter and congratulate him for being named to such a high honor,” said Ichiro Taninaka, President & CEO. Georgia-based NAPIM, founded in 1916, is the only national trade association for the printing ink industry.